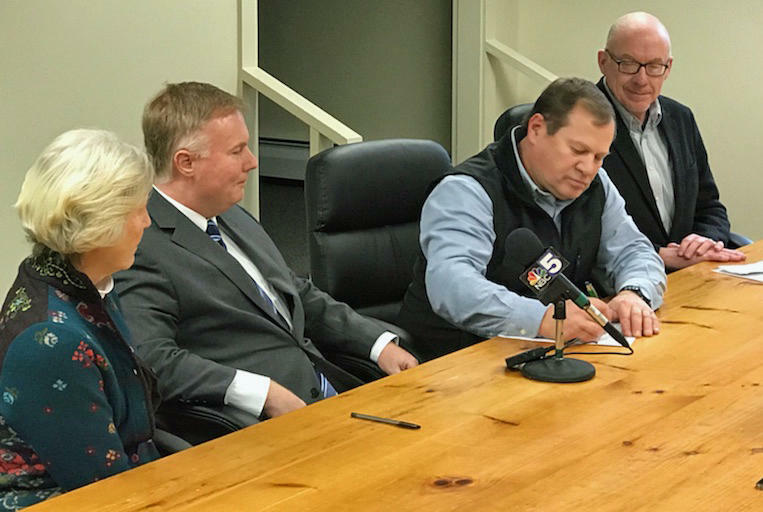 State Senator Jane Kitchel, Joe Rossignoli of National Grid, Northeastern Vermont Development Association President Grant Spates and NVDA Executive Director Dave Snedeker were on hand for the signing of a Memorandum of Understanding. The National Grid energy company and economic development officials in the Northeast Kingdom have signed a deal that commits $20 million to the region for hosting transmission lines. National Grid’s Granite State Power Link is planned to carry Canadian wind power to parts of New England. The project includes a converter station and nearly 53 miles of transmission lines in nine Northeast Kingdom communities. The $20 million will be paid to the Northeastern Vermont Development Association over 40 years. The money will be used for economic and community development grants and the association’s revolving loan fund for businesses. David Snedeker, executive director of the association, says it’s great news for the region, but it is contingent upon the project being selected and brought online. The earliest that could happen is five years from now.